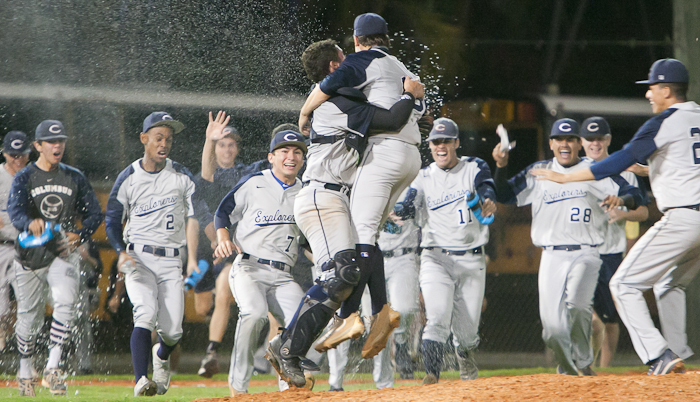 Columbus celebrates the final out of a 1-0 region finals victory over Miami Beach on Tuesday. E.J. Doskow hit a home run with two outs in the fourth inning and pitcher Anthony Arguelles made it stand up with a complete-game shutout, as the Columbus Explorers held off host Miami Beach 1-0 on Tuesday night in a 9A regional final. The Explorers (22-5) advance to the state tournament for the third time in four years thanks to Arguelles’ gutsy performance. The senior right-hander struck out nine and walked just two. He did not allow a runner past second base and used the command of his breaking pitch to keep the Hi-Tides off balance at the plate. Columbus will take on the Jupiter Warriors in a 9A state semifinal on June 1st at Hammond Stadium in Fort Myers. The Warriors (17-11) advanced with a 2-1 win over Douglas on the other side of the playoff bracket. Miami Beach (15-12) had baserunners in every inning, but couldn’t get the clutch hit off Arguelles. David Castillo doubled with two outs in the second inning but was stranded. Ricardo Garcia (2-for-3) led off the Hi-Tides’ fourth with a single and was bunted over to second by Emmanuel Arias. That’s as far as Garcia got. 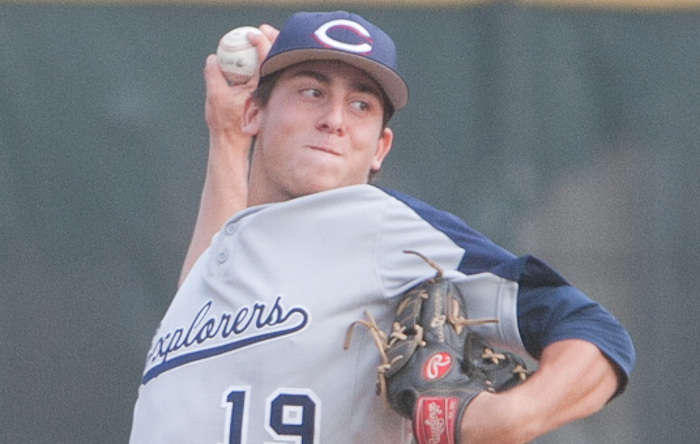 Columbus Explorers pitcher Anthony Arguelles threw a complete game shutout in the region finals on Tuesday. Columbus won 1-0 over Miami Beach. The Hi-Tides threatened in the sixth when lead-off hitter Bramdon Perez walked and stole second. But Arguelles recorded back-to-back strikeouts, and Explorers’ shortstop Ariel Garcia made a long run into shallow left field to catch a pop up off the bat of David Munoz to end the inning. Columbus manager Joe Weber had his closer warming in the bullpen to pitch the seventh, but instead stayed with Arguelles, who closed it out. But on this night he needed one good swing of the bat to help him out, and Doskow provided it. The Explorers’ senior first baseman smacked a first-pitch fastball over the left-field fence. Miami Beach Hi-Tides pitcher Nolan Santos pitched a complete game in a 1-0 loss to Columbus on Tuesday. Doskow said he didn’t know it had cleared the fence until after he was rounding first base and heard the roar from his teammates. 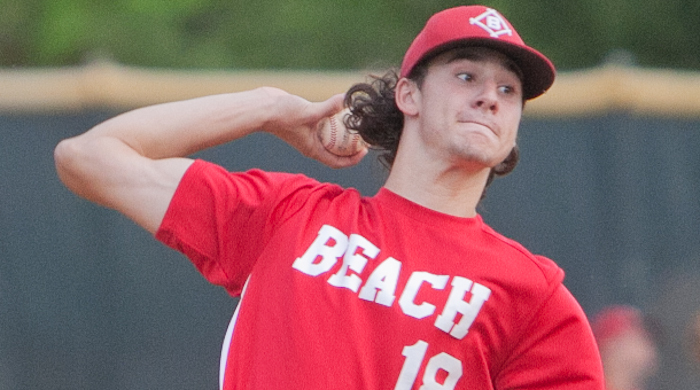 It was one of five hits off Miami Beach junior Nolan Santos, who was masterful as well on the mound for the Hi-Tides. Doskow was one of just two Explorers to get past first base against Santos, who threw a complete game, striking out seven while walking just one. Santos said he didn’t think it was a bad pitch that Doskow hit. Outside of that, Santos gave up just singles to Joel Gonzalez, Christopher Bohrer, Doskow and Mike Mas. He retired the final eight batters he faced in order.